The theme for this month’s cooking club meeting was Greek. I love Greek food, but for some reason I don’t eat or cook it very often, so I was really excited. This month I was in charge of appetizers so I made cumin sticks and dolmas. 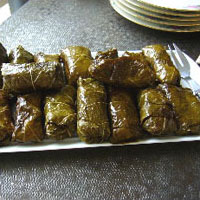 The cumin sticks were great, but the dolmas were not so great. The dolma flavor was outstanding—they were packed with onions, pine nuts, currants, parsley, dill and mint, but the rice was WAY overcooked and mushy. The recipe I used called for an hour of cooking time, which seemed like a lot, and I guess it was. Ooops. I also brought Ouzo to drink with the appetizers. 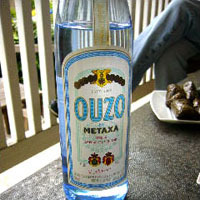 Whenever I say “Ouzo”, people cringe and think it’s such a rot-gut drink, but it’s REALLY delicious on lots of ice with just a splash of water. I mean the Europeans drink Pernod and Pastis and this is basically the same thing. After appetizers we got to eat LAMB. I’ve been craving lamb a lot lately and this one was delicious. 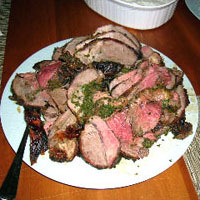 It was a leg of lamb stuffed with copious amounts of garlic and herbs and grilled to perfection. I honestly couldn’t stop eating it. It was served with a lemony avgloemono sauce, creamy tzatziki and perfectly fried and puffed pita breads. The accompanying Khoriátiki Saláta, was seriously the best Greek salad I’ve EVER eaten. It was packed with tomatoes, cucumber, onion, banana peppers, black olives, feta, capers and hard-boiled eggs. I don’t know exactly why it was so incredible, aside from the fact that it was made with love and fresh banana peppers from B’s garden. I have to plant some of those… they’re beautiful tasting peppers. 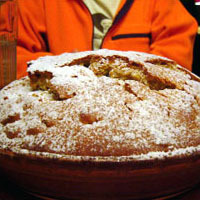 For dessert M made Fanouropita, which is a dense olive oil cake. It was almost like a bread… not too sweet, but topped with a light dusting of powdered sugar. I’m not sure if anyone else liked this, but I really went nuts for it. I want to make one, slice it, toast it and eat it for breakfast. I’m interested in cooking club. how can i join you? Our cooking club is actually limited to just the five of us right now, but if we ever open it up I’ll let you know! Thanks!